The wait is over….Live Portrait is here! StudioProgroup introduced Live Portrait in January 2015 with an overwhelming response. Now it is time for you to take it to your schools and of course we anticipate the same overwhelming response form them. Live Portrait is an app on your smartphone or media device that when scanned over the portrait, the portrait will turn into a video instantly. Basically we have developed a system that allows you to make a portrait come to life. We have several sample images for you to demonstrate this first hand. 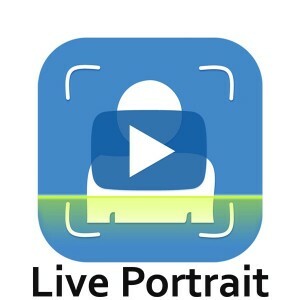 Live Portrait is trademarked but as long as you are using this app through SPG, it is OK for you to use the name. How do you market Live Portrait? Underclass – have the students make a brief comment…favorite food, color or subject. Senior – heartfelt thank you to Mom and Dad. Groups – let the class show their school spirit. Yearbooks – allow the principal and staff to send messages to their students. StudioProgroup and Live Portrait will provide the following services which is included in the price. Upload raw video footage linked to an image through a customer dashboard. Compressing the video footage so that the video plays quickly and easily. Cropping the video to fit the print size. Editing and splicing the video to the desired length. SPG has video linking software that automates the linking of the video to the portrait and the data. Pricing includes 3 years of web hosting per video. Infinite Possibilities… Real photography will never be replaced. Download the Live Portrait App to scan this image.